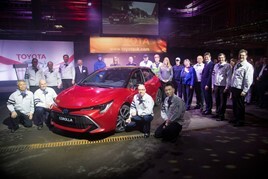 Toyota has now started production of its new Corolla hatchback and touring sports wagon at its Burnaston factory in Derbyshire. The new Corolla will be the first Toyota model in Europe to offer customers the choice of two hybrid powertrains: an upgraded 1.8 litre engine that is manufactured at the Toyota Deeside engine plant in North Wales, and a new 2.0-litre hybrid powertrain. The new Corolla Hatchback and Touring Sports wagon will be launched commercially across Europe from February 2019. A launch event to mark the start of production was attended by Dr Johan van Zyl, president and chief executive of Toyota Motor Europe, Hiroki Nakajima, mid-size vehicle company, executive vice president and concurrent chief engineer, Toyota Motor Corporation, the Rt Hon Greg Clark MP, the UK Secretary of State for Business, Energy and Industrial Strategy, and Koji Tsuruoka, Japanese Ambassador to the United Kingdom. In March 2017, Toyota Motor Europe announced investment of £240 million in its Burnaston operations for the introduction of TNGA production, upgrading its facilities with new equipment, technologies and systems.